After the Kingpin's assassination attempt at the conclusion of Peter Parker Spider-Man #95, Norman Osborn phones an unknown individual to inform him (or her) that, "It is time for the Gathering of Five." The details of the Gathering of Five are fleshed out in two back to back story arcs that cross over all four Spider-Man titles. Norman's insatiable desire for power is seen throughout both arcs as he uses every nefarious tactic in his arsenal to successfully perform the Gathering of Five. The first story arc, aptly named the Gathering of Five, commences in Sensational Spider-Man and concludes in that title as well, bringing the first volume of Sensational Spider-Man to closure. In an attempt to gather the "fragments" necessary to perform the Gathering of Five ritual, Norman Osborn visits the Technomancer building at the onset of Sensational Spider-Man #32. The Technomancers are a secret society "dedicated to the acquisition of power through means both scientific and supernatural", eerily similar to the Cabal of Scriers. 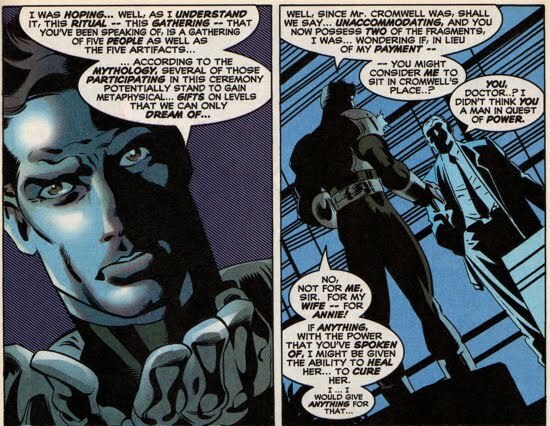 Norman, along with Dr. Greg Herd (aka Override), tries to persuade one member, Hamilton Cromwell, to join the "gathering" that he has planned. Hamilton refuses citing that he is too old and does not want to "wager with such ravenous forces" and he warns Osborn to "turn away from this". 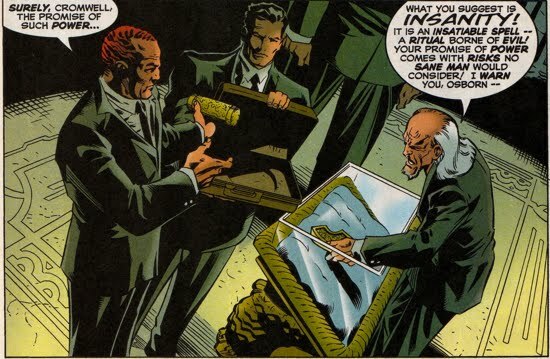 Osborn and Herd soon leave, but after Hamilton shows them the fragment that is in his possession. Since Norman has uncovered the location of the fragment within the Technomancer's building, he sends Override to steal the precious shard. Spider-Man's involvement in this charade is totally random, after stopping a mugging he spots Override running through the streets causing a traffic stir. Knowing that Override is a pawn of Osborn he decides to track him and follows him to the Technomancer building. Override eventually finds the fragment and Spidey almost stops him, but the henchmen is able to escape after distracting the wall crawler by unleashing monstrous aberrations that were housed in the building. Spider-Man subdues the aberrations but Override is gone, already on his to return the fragment to Norman Osborn. Instead of accepting Norman’s financial reward for retrieving the necessary fragment, Dr. Herd barters for a spot in the ritual itself. The spot is vacant due to Cromwell’s unwillingness to participate, and Dr. Herd hopes that he will be able to restore the health of his wife Ann (aka Aura) who was brutally injured back in Sensational Spider-Man #25. Osborn accepts Herd’s request, claiming that he is moved by Herd’s “noble intentions”. At the conclusion of the story, Joe Robertson finds Alison Mongrain in Paris and informs her that he is there to help. 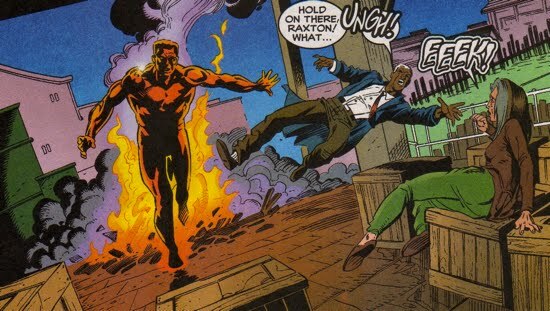 Part two of the Gathering of Five is featured in Amazing Spider-Man #440 as an apparent brainwashed Mark Raxton (aka Molten Man) tears his way through the streets of New York. Spidey tries to stop the former villain, but to no avail, instead the wall crawler resolves to follow him and negate any of the damage he creates on his path. Meanwhile, Norman Osborn has made his way to a pawn shop in Greenwich Village where he is conversing with the shop’s owner, Morris Maxwell, regarding the Gathering of Five. 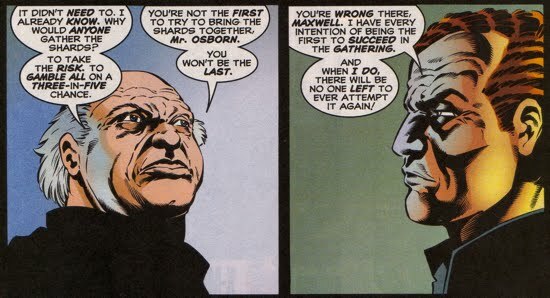 Norman’s intentions for the Gathering are partly revealed as he claims that he will be “the first to succeed in the Gathering” and when he does “there will be no one left to attempt again!” It also becomes clear that Maxwell is in possession of one of the shards and may be a willing participant for the ritual. Raxton eventually makes his way to his target, Alison Mongrain, who has recently returned to New York along with Joe Robertson via a tramp steamer. After a futile, albeit noble, attempt by Robertson to stop the speechless Molten Man, Spider-Man arrives just in time to spare the duo. The third chapter of this story arc is continued in Peter Parker Spider-Man #96. 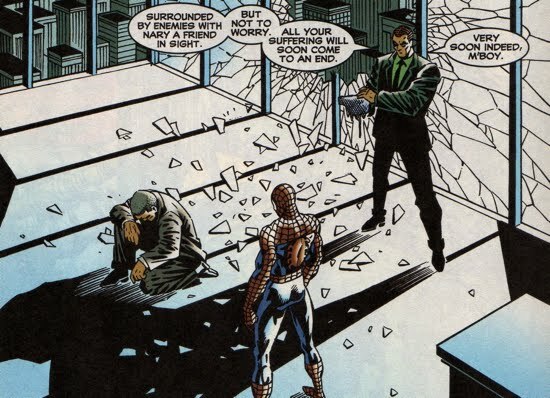 While Peter Parker is working late at the heavily damaged Daily Bugle (from Nitro’s explosion back in Peter Parker Spider-Man #95), he is approached by his nemesis Norman Osborn. 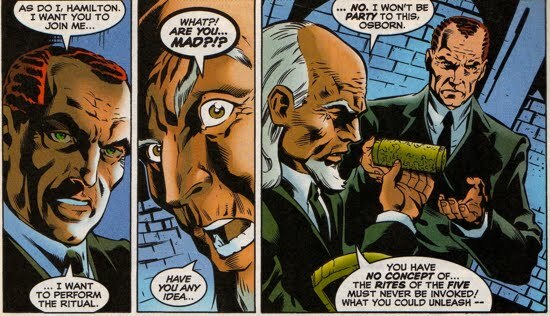 Norman taunts Peter with the fictional story of an “ordinary package” that unleashes a weapon that can reduce a human body to its “most basic components.” Peter immediately receives this as a veiled threat from Osborn and the businessman continues to push Peter’s buttons further. Norman reminds Parker that there is nothing he can do to stop him and that informing the police would be futile since no one will believe that Norman the philanthropist would be capable of such a horror. Peter then goes to see Jameson, who explains to the young photographer that an entire biological research facility is gone as the researchers apparently “melted”. Norman interrupts Peter and Jameson’s conversation, instructing them that the Daily Bugle will not publish this sensationalistic nonsense. 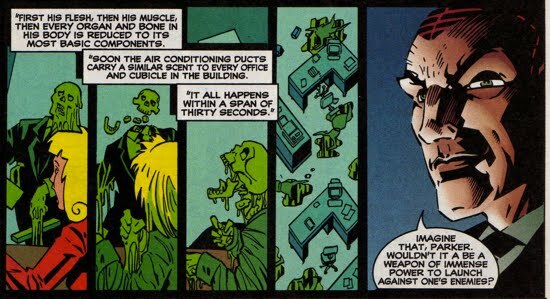 Jameson counters Osborn’s instructions with the connection between this biological research center and a small subsidiary of Osborn Industries. Osborn then once again threatens Jameson and his family. Realizing that this is tragedy is most likely related to the fictional story Osborn told him earlier, Peter changes into Spider-Man leaves the Daily Bugle in a fury. Osborn watches Peter take off claiming he is “so easy” to manipulate. While web-swinging through the city, Madame Web “appears” and tells Spidey that she needs his help. Previously, Madame Web was having visions of her death and in those visions Norman Osborn is able to restore her youth via The Gathering of Five. Osborn (garbed as the Green Goblin in the vision) informs her that she will have a place in the Gathering if she brings one of the missing fragments to him. Madame Web solicits Spider-Man’s help to find the piece, which he does (unfortunately for the reader this is done completely off-panel). After giving the desired fragment to Madame Web, the mystic informs Spider-Man that Jameson is about to “make the mistake of his life.” So Peter rushes back to the Daily Bugle. Meanwhile, back at the Daily Bugle, the confrontation between Norman and Jonah reaches its boiling point as Jonah removes a handgun from his desk drawer with the intent to kill Osborn. Osborn is waiting in his Daily Bugle office and he explains another important facet to his planned Gathering. Norman reveals that his time spent with the Scriers (most likely during his European exile) gave him all the necessary information he needed to acquire the fragments and ensure that he stood at the center of the Gathering. This is most likely how he came into possession of the “spindle” piece, and it is at this point that Jameson comes barging into Osborn’s office. After a few taunts from Osborn, Jameson pulls the gun on the villain claiming that “it ends tonight.” Osborn is not phased by the gun in his face and encourages the publisher to pull the trigger, Jameson cannot do it though and he drops the gun to the floor. Osborn picks it up and points it Jameson stating that he “should put [Jameson] out of his misery”. Spider-Man then comes crashing through the window and webs up the pistol, rendering it useless and most likely saving Jameson’s life in the process. At the conclusion of this story Madame Web presents the fragment to Osborn and immediately has a vision of a “genetic bomb” and the world “brought to its knees by [Norman] Osborn”. Norman now has four of the necessary five fragments in his possession. 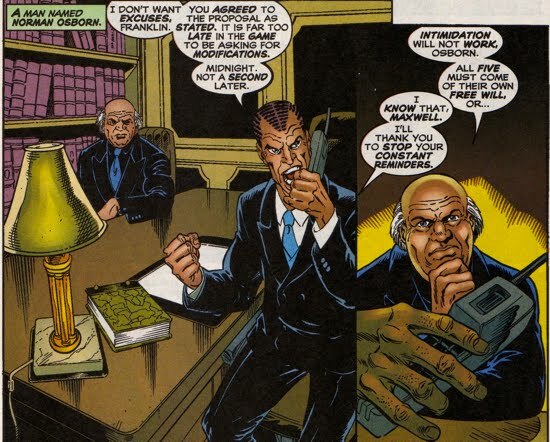 Norman Osborn continues to finalize his plans for the Gathering of Five in the fourth installment of this story arc, featured in Spectacular Spider-Man #262. Osborn argues angrily on the phone with a man named “Franklin” who appears to be having second thoughts regarding his participation in the Gathering. Unbeknownst to Franklin, it appears that his son or daughter was listening in on the conversation with Osborn because after they hang up, a mysterious person comments “geez, Dad…you are such a wuss”. The story itself mainly focuses on Spider-Man as he teaches a lesson to a couple of trouble-making bicyclists. At the conclusion, Osborn is waiting at the airport and expecting to find his consort Franklin. However, Norman is surprised to see that it is not Franklin that greets him, but rather someone else who has brought him the final necessary fragment. 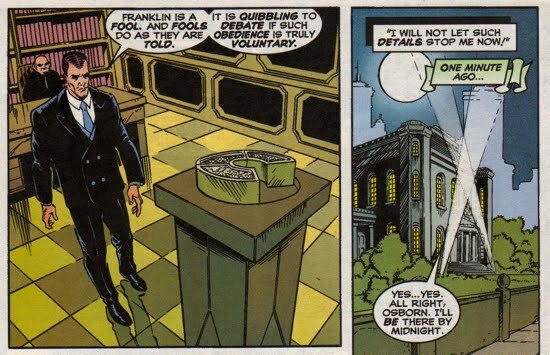 The identity is kept hidden, but the person is wearing the same glove as the son/daughter of Franklin who was eavesdropping on the conversation between Franklin and Osborn at the onset of the story. The Gathering of Five story arc concludes in Sensational Spider-Man #33, as this story begins with Dr. Greg Herd visiting his wife Ann at the hospital. The damage she sustained as Aura has left her on life support, and Herd contemplates pulling the plug because this is no way for her to live. He doesn’t though, as he maintains hope that the Gathering will solve all the problems that they face. As Override, Herd robs an armored bank car to provide the funds necessary to support Ann’s medical bills, in case the Gathering does not pan out as he hopes. But soon the Herd marriage takes a new turn as Ann solicits the aid of Norman Osborn. Ann explains to Norman that she is constantly in pain and that she can no longer stand being a burden to her husband. She insists that Osborn help her, Osborn complies, but only on the stipulation that she give it a few more days because the Gathering may still bring hope. 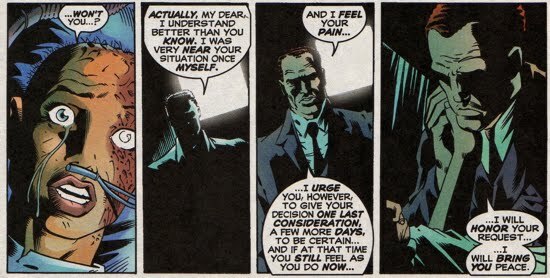 If she still has the same feelings after that time, Osborn agrees to “bring [her] peace”. Spider-Man eventually catches Override, but once the villain is brought to the police, he easily escapes. Herd then returns to his wife’s side at her hospital bed claiming to have all the money they will need and that she needs to be strong and hold on a little longer. The stage is now set to perform the ritual of the Gathering of Five.